A floral pumpkin wreath that acts like a vase is easy to create using fall flowers, berries and grasses attached to a grapevine wreath base. Have you seen people use a pumpkin as a vase for their dining room table? I was looking for something fun to create for this year’s fall decor, and thought of this pumpkin centerpiece idea. Instead of using it for my dining room, I decided to create a floral pumpkin wreath by cutting an old plastic pumpkin in half, and attaching it to a grapevine wreath. It was surprisingly easy to cut this pumpkin with an old serrated kitchen knife. Just follow the line along the molding. Then cut around the top. You can use a piece of cardboard and glue it to the back. Since we have double front doors in our house, cutting one pumpkin in half gave me two perfect pumpkin vases with flat backs. Just hot glue the pumpkin vase to a grapevine wreath . Then add a bit of floral foam inside, which will make it easier to arrange your flowers and other picks. It’s easy to find all kind of faux flowers, berries and other fall pieces this time of year at any craft store. I bet most of you have some laying around from past projects that you can reuse. 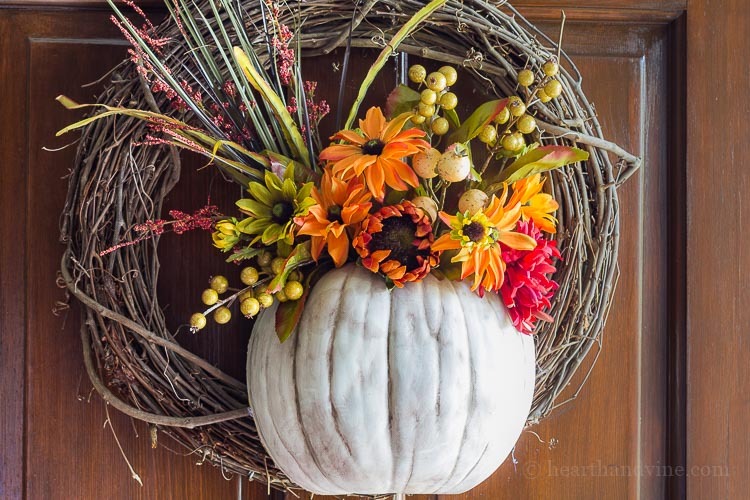 You may even have some natural options around your home such as viburnum berries, bittersweet, hydrangea blooms, or some grasses which would look wonderful in this pumpkin wreath. The funny thing is that we just purchased a new front door, with side lights to help bring more light into the house. I guess I’ll have to give one of these away, or move it somewhere else in the house. Thanks, Charlotte. I love fall too. I just wish it lasted longer. Beautiful colors! Love this wreath design. Thank you. Fall colors are so welcoming this time of year. Now if the weather can catch up. Very nice and love how you turned that pumpkin into two pieces. Very welcoming entry!